New Years Eve is right around the corner and a fun nail tutorial is just the thing you need to amp up your look for the festive day. These nails are so simple and so much fun. 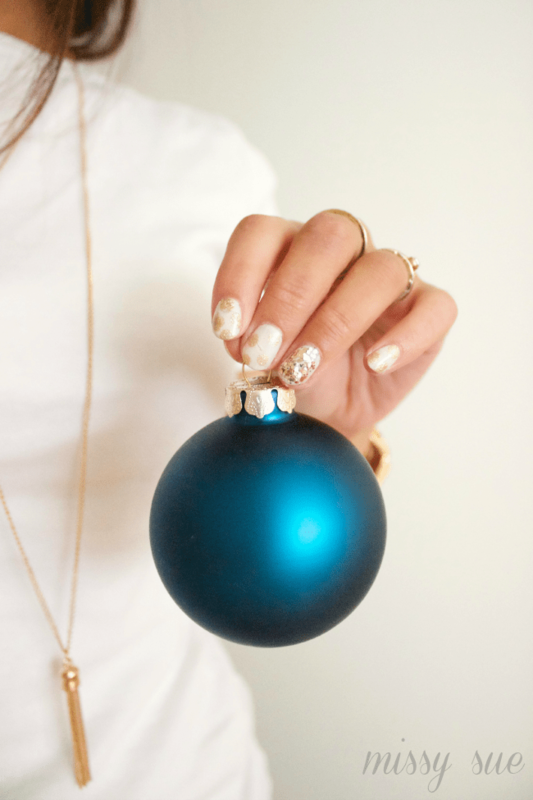 This holiday nail tutorial can be done in any color combo so get creative and do whatever your little heart desires. I love these soft shades but think it would also look amazing with black and gold, white and silver, or even red and gold. The trick is to use a really thick glitter polish so you can achieve a thick coat. Find some favorites here that would also work perfectly as gifts too! 1 / Paint nails with a light pink or white polish – I am using ‘Ballet Slippers’ by Essie. 2 / Using a cotton swab and gold polish, create tiny dots on each nail, skipping the ring finger. 3 / Paint the ring finger nail with a dense gold glitter polish. 4 / Finish with a sheer top coat. Ah! I love this! <3 Adorable. I need a white polish…. Perfect nails! I love white and gold combo!